I was surprised to learn that Restaurant Depot developers had backed out of their plans to purchase public land next to Sarasota’s prized Celery Fields. It was the tenor of the fierce opposition that squashed the project, not the ownership disclosures, Bailey said. With no disrespect toward Mr. Bailey, he is mistaken. Let me be clear: it is my position—and that of others who have worked tirelessly to oppose this project—that any development on publicly held conservation lands is unreasonable, without vigorous public debate. Mr. Bailey, it is not your client, per se, that we oppose. In fact, I believe that Restaurant Depot would make a fine addition to the Sarasota area. I would love for them to succeed here, and would gladly see them added to Sarasota’s tax base. At issue is not the business itself, but the location. There are plenty of areas within Sarasota County where industry is a good fit. But the parcels of land that make up the four corners of the Apex Road/Palmer Boulevard intersection (the “quads,” as they are known) are most decidedly not among them. The Restaurant Depot currently operating in Tampa, for example, is located in an area that is undeniably industrial in its character. In that location, having as many as 100 vehicles per hour coming in and out of the facility, seeing piles of pallets stacked up outside, and finding rotting food waste in dumpsters is not as uncommon for the industrial areas, which can be more tolerant of such conditions. Had Mr. Bailey’s client selected a similar area within Sarasota County to propose construction of its facility here, I’m sure that negative public attention of the sort that they have experienced in the last month would not have been reasonable. What is unreasonable, however, is not so much the actions of Mr. Bailey’s client, but the actions that led to the “quads” being re-categorized as “surplus,” when they have clearly been considered “conservation” lands for the last two decades. This is not a case of a privately held parcel of land that happens to neighbor a park being rezoned for industrial purposes. This is a case of public lands that are part of the Celery Fields being sold off by our elected officials. Are the lands indeed “surplus?” If so, then perhaps Sarasota County would be good enough to produce the study whose findings support such a conclusion. If such a study exists, then why not bring it out into the open? Instead, efforts on the part of a broad coalition of interests, including local businesses and homeowners’ associations, to obtain information from county government about the internal process that led to the “surplus lands” designation for the “quads” have been completely unfruitful. It is entirely conceivable that Sarasota County acquired more land than was necessary to accomplish the flood-prevention objectives that led to the acquisition of the Celery Fields lands in the first place. Since the opening of the Celery Fields Regional Stormwater Facility in 1999, it seems to have been doing its job rather well, although we have not had another 100-year flood like the one that occurred in 1992 in order to fully test its mettle. But assuming that it is doing its job well, do our elected officials have a responsibility to turn lands that have indeed turned out to be “surplus” back over to the private sector so that they can produce tax revenues? But I contend, alongside others who have been actively opposing the developments that have been proposed for the “quads,” that this is a conversation that we need to have as a community, and not one that should occur behind closed doors, as seems to have been the case. There is thus a thoroughly reasonable basis for opposing Restaurant Depot and other developers who have proposed what many believe are unreasonable uses for the lands in question. And there may be more than one legal basis to oppose them as well. There are reasonable uses for Celery Fields lands. The “green space” function they have been serving for some years comes readily to mind. Are there others? Even some that might produce tax revenues for Sarasota County? Let’s talk about them. Openly. David G. Johnson and his wife and daughter live in a community neighboring the Celery Fields, where they regularly enjoy the birds, wildlife, and even some exercise. 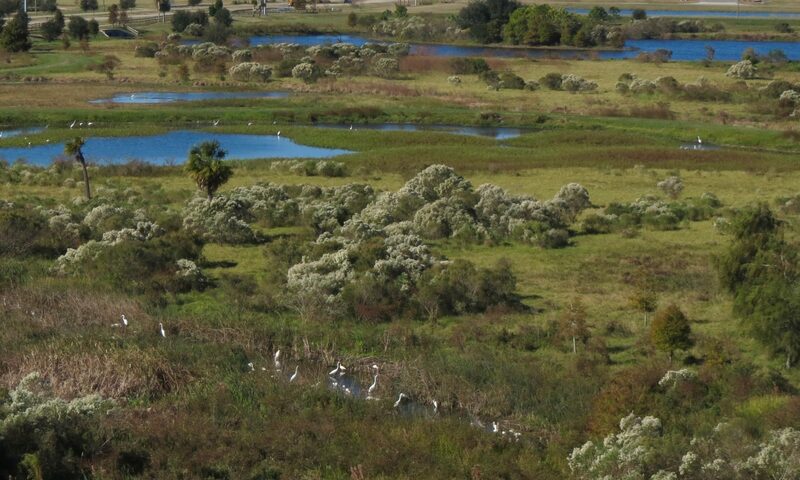 The Celery Fields are one of Sarasota’s greatest treasures. I pray they remain untouched. Agreed, Cynthia! Thanks for taking the time to add your comment here. Cheers! The Celery Fields only get more beautiful with time. There are times when civic leaders might “let nature take its course,” rather than pursue rezonings that have all the grace and beauty of a trainwreck. Sarasota County Commissioner Michael Moran said “there is no conflict of interest” at the public hearing for the Celery Fields rezoning, “We have taken the oath of office.” Disclosure of the names of the buyers was the problem and The Restaurant Depot later withdrew its offer. I wanted to see the oath. Essentially, it states: I swear to protect and defend the constitutions of the United States and the state of Florida; I am duly (properly) qualified and I will well and faithfully perform the duties of Sarasota County commissioner. I asked the county clerk by email if that oath meant that if commissioners received campaign contributions from the buyer of county-owned property and rezoning was at stake, or if they had any shares or stocks with said buyer, should they recuse themselves? I never got an answer. But the real big, fat elephant is that commissioners Moran, Paul Caragiulo, and Alan Maio received thousands of dollars in campaign contributions from Gabbert. These contributions are legal. The perception here is so obvious, so egregious, that anyone can see what’s going on. Pollution, excessive traffic, and disruption of a wildlife habitat are at stake. Voice your opinions to the honorable county commissioners. Next PostNext Say NO to Construction & Demolition Debris Processing at the Celery Fields!